When it comes to you, I try to hold back the tears in my eyes. 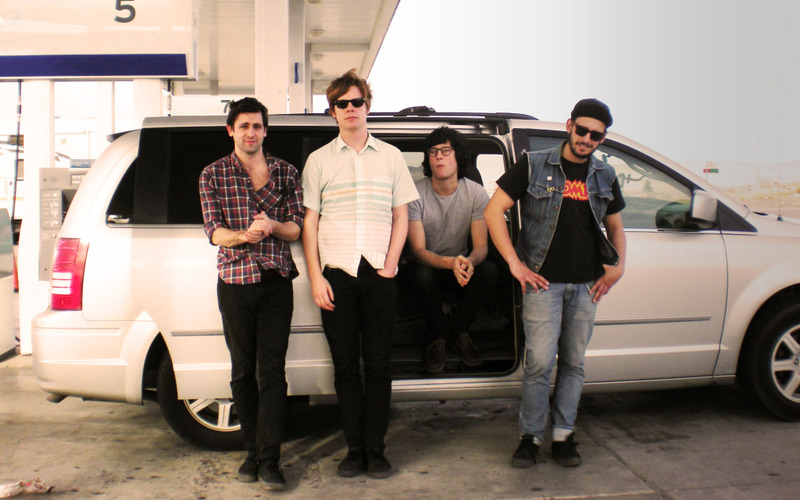 Dead Ghosts are a four-piece garage rock band from Vancouver, British Columbia, Canada. The band formed in 2007, and consists of Bryan Nicol (guitar, vocals), Drew Wilkinson (guitar), Mike Wilkinson (drums), and Maurizio “Moe” Chiumento (bass). Their sound is influenced by everything from 50's rockabilly and doo-wop, to 60's garage, and punk music, and is often likened to bands such as the Black Lips and King Khan and BBQ Show. The “What To Do” 7 inch was their first release, which came out in 2008 on Milk 'n Herpes Records. After releasing a number of 7 inches, including a split with Smith Westerns, they released their self-titled debut LP on Florida's Dying Records in late 2010. They are currently working on recording their second LP, which will be released in 2012, and are planning on playing SXSW Festival in March of 2012, followed by a European tour. Some bands take hours in the studio to perfect every single sound, handing it off to producers who polish the music even further, until it's squeaky clean. Then there are bands like Dead Ghosts, who are deliberately and unabashedly lo-fi in their production. The curiously-named foursome (how can a ghost die?) hails from Vancouver, Canada—not the most obvious location for a band influenced so heavily by 60s surf rock and West Coast garage. Dead Ghosts started off with just Bryan Nicol (guitar, vocals), Mike Wilkinson (drums), and his brother Drew (guitar). After putting up a Craigslist ad looking for a bassist who was into 60s garage rock, they rounded off the band with Moe Chiumento. Since coming together and forming Dead Ghosts in 2007, the band released a string of 7" singles before releasing their self-titled debut LP in late 2010. There are thirteen songs on the album, but it only clocks in at just over half an hour—making each track like a little morsel of deliciously trashy garage rock. “Off the Hook,” for instance, is the longest song on the album—and it doesn't even hit the four minute mark. As Nicol comes in singing, “Every time I tell a lie, it's off the hook, it's off the hook,” you might have the urge to double-check your headphones for a loose wire. But it's this completely fuzzed-out quality that makes Dead Ghosts' music so instantly endearing—it's like a vinyl record that's been played over and over across generations of appreciative listeners. “I Want You To Know” starts off with a shout of “one-two-three!” before a roots of rock n' roll guitar rhythm comes in with an occasional handclap. It's as if they've dug up an obscure 50s record from the grave of a rockabilly fanatic, and put their own do-it-yourself punk spin on it. “How The West Was Fun” is what happens when the golden age of country music steps into a dive bar, and takes shots of whiskey with garage rock. It has a hint of twangy guitars, but enough of a roughened edge to keep it from sounding cheesy. “When It Comes To You,” with its surfy guitar riff jauntily mixing with background vocals of “oohs” and “bah bah bahs,” is the catchiest track on the album. This is the type of song that would fit right into the soundtrack of a vintage skate video, with scratches of worn-out film filtering over scenes of shaggy-haired skate rats cruising towards a sunset. Even through their deliberately unpolished production, Dead Ghosts prove that they know a thing or two about creating songs that will stick in your head.